Not the most creative title in the world, but what are you going to do? It fits. Anyhoo, made some flower and butterfly decorated sugar cookies for an event at work. I also made some chocolate chunk cookies, but they weren’t as pretty. I made a set with more flower designs for my Mom’s retirement, but I didn’t take pictures of those. I’m basically the worst blogger ever. I like butterflies and flowers, but who doesn’t? And who doesn’t like chocolate chunk cookies? Well, that’s all for now. Enjoy! We recently moved into an old farmhouse and we thought it would be fun to go retro with the kitchen decor. We inherited a 1940's kitchen cabinet from Mr. D-oh's Grandma May when she passed a few years back. We love it and it reminds us of Grandma, so why not decorate the kitchen around it? Craig’s List has been good to us thus far. I found an old chrome and Formica table and chairs (in yellow and green Moonglo) as well as a remarkable old stove. I’m still hunting for a refrigerator, but I’m in no hurry. Anyhoo, I made a chocolate cake for a family get-together. Mint chocolate frosting with roses. Added some blue because I read somewhere a long time ago that you should use at least three colors when decorating. So red, blue, and green for this one. I don’t know if that’s really a thing, but it stuck with me. And here’s a bit of the kitchen with the amazing stove. It’s purported to be a 1948 Western Holly. Works like a champ and kind of looks like we have a laundromat in the kitchen. I'd never seen a stove with porthole windows or a yellow top before, and it matched the table so we had to get it. Not pictured is the neon flamingo on top of Grandma May’s green cabinet (you can see a bit of the cabinet in the first photo above). Trust me, it’s fabulous. Ups the kitsch factor just the right amount. Well, that’s all for now. Hope you enjoyed the mini-tour. 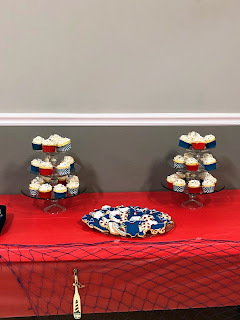 Vanilla almond cupcakes with raspberry filling and raspberry frosting for a bridal shower. I also brought brownies, but I posted That recipe a few years ago. Anywho, that’s all for now. I’ll post pictures of my sweet “new” kitchen soon. So I got invited to my first Matilda Jane trunk party last week. I had heard of Matilda Jane, sort of, but didn't really know what it was. Turns out it's super cute girls' clothing (big and little girls!). I was asked to make themed cookies, so I had to do a little internet research. I found out later that when Matilda Jane releases a collection, if an item sells out they don't replace it. 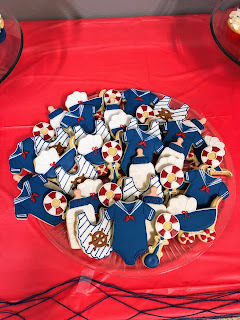 So at least one of the dresses I based my cookies on was not available by the time the party was held. D'OH! Oh well, I still think they were cute. This was the "Once Upon a Time" collection for fall, and I really enjoyed the colors. These took me out of my comfort zone, too. I tend to do cookies that are similar in style most of the time. These were definitely not my regular style, but they were fun. The girl accompanied me to the trunk show, of course, and she had a wonderful time! She is ALL about clothes right now. *sigh* At 8 she is more fashionable than I have ever been. Decorated sugar cookies for fall! Leaves, pumpkins, apples, and sunflowers. I saw a couple different versions of the trees on Pinterest and decided to give them a go. I think the trees sort of pulled them all together. The chocolate cake with peanut butter frosting and ganache that I made last year was so popular that I turned it into cupcakes. Because, honestly, they're easier to deal with sometimes. Go-to dark chocolate cake with peanut butter frosting and a ganache drizzle. Very tasty, if I do say so myself. They're best if eaten with a fork. Just being honest. The cake recipe is here. To make cupcakes, fill cupcake liners 1/2 full and bake in a 375 F oven for about 16 minutes. Cool completely before frosting. Mix butter, peanut butter, shortening, salt and vanilla extract in the bowl of a stand mixer until well-combined. Add the powdered sugar and mix until incorporated. Add cream until the frosting reaches the desired consistency. Beat for 5 minutes on high speed. Frost cupcakes and top with a drizzle of ganache. Chop chocolate and put in a stainless steel bowl. Set aside. Heat cream in a heavy saucepan until it just starts to bubble around the edges. Don't boil. Pour the cream over the chocolate and whisk gently until the chocolate is completely melted and the cream is fully incorporated. It will take a few minutes. I use a disposable piping bag with just the very tip snipped off to drizzle.